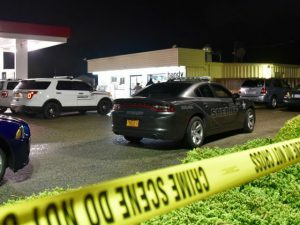 The Wayne County Sheriff’s Office has identified a third suspect in last month’s robbery and shooting of a convenience store clerk. On Wednesday, deputies announced that 18 year-old Khalik Najm Green of Tommy’s Road, Goldsboro was wanted on outstanding warrants charging him with attempted murder, armed robbery, kidnapping, and breaking and entering. On July 11th, Green and two accomplices allegedly approached the clerk at the Handy Mart on US 13 North as he was closing the business and locking the front door for the night. At gunpoint authorities said they forced the employee back inside while they stolen lottery tickets and tobacco products. When the clerk tried to escape he was shot. Warrants have also been obtained for Tyquellas Thompson, 18, also of Tommy’s Road, Goldsboro. He also remains at large. Ervin Lee Waters, 19, was arrested last week for his alleged role in the shooting and robbery.